1 . Set oven to 450°. After spraying a large baking sheet with nonstick spray, set aside. 2 . Add all meatball ingredients in a large bowl. Mix well, using hands. It is the easiest way though a bit squeamish. With the mixture, form 24 equal sized meatballs and place them on the baking sheet. 3 . Bake 8 to 10 minutes until meatballs are cooked. At the same time, drain peaches and bring to a food processor. Blend until smooth and transfer to a slow cooker. Pour all remaining sauce ingredients and mix well to the slow cooker. 4 . Carefully, bring meatballs to the slow cooker, stir to coat. Cook covered on low for about 4 hours. 5 . Stir well and serve meatballs with the extra sauce from the slow cooker. 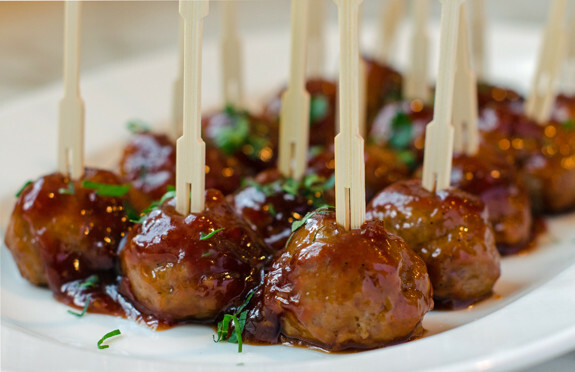 Use toothpicks for meatballs.